Perma-Vault, the largest manufacturer of drop boxes in the United States, offers a large selection of in-room hotel safes and B-rated depository safes. Other products include: lock drop box, cash box, wall safes, in wall safes, pistol lock boxes, and electronic safes. Our diverse product line is distributed to the locksmith industry through locksmith and hardware distributors nationwide. 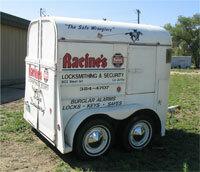 Under certain circumstances, we will move your safe for you. If you are in need please use the contact form to email us.